Konami made an exciting announcement this morning, noting that three new Anniversary Collection sets will release this year in celebration of the company’s 50th anniversary. Among these Anniversary Collection packages is one dedicated to eight of the company’s popular arcade titles, another to the Contra series, and finally a collection of Castlevania titles. Konami announced three new Anniversary Collection sets which include one for their Arcade Classics, one for Castlevania, and another for Contra. 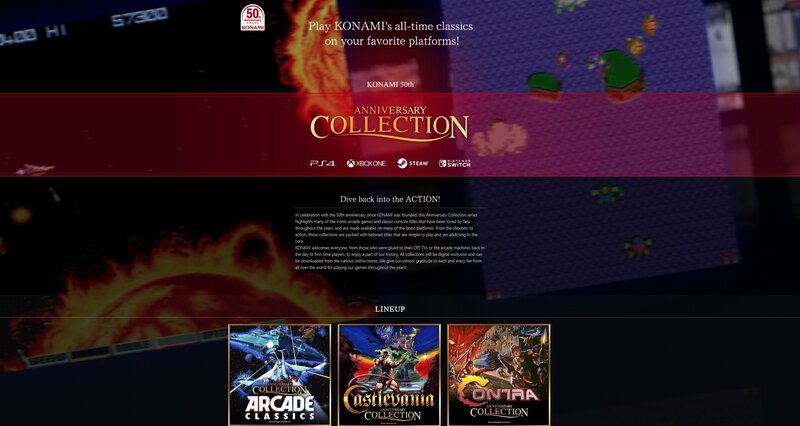 Kicking off the Anniversary Collection series is the Konami Anniversary Collection: Arcade Classics which is scheduled to release on April 18 for Xbox One, PlayStation 4, Nintendo Switch, and PC via Steam. The collection is priced at $19.99 and includes eight different arcade titles from Konami including Thunder Cross and Gradius. Below, we’ve listed all of the games featured in the Arcade Classics collection! If arcade games aren’t your thing, Konami also noted that there will be Anniversary Collections for both Castlevania and Contra. For Castlevania fans, the Castlevania: Anniversary Collection is slated for a release later this summer and will also include eight games, though only four of these have officially been confirmed. The Contra: Anniversary Collection is also tapped to release this summer, and like the previous two Anniversary Collection setss, includes eight different Contra titles. Again, only four of the eight games have been revealed by Konami thus far. “In celebration with the 50th anniversary since KONAMI was founded, this Anniversary Collection series highlights many of the iconic arcade games and classic console titles that have been loved by fans throughout the years, and are made available on many of the latest platforms. From the shooters to action, these collections are packed with beloved titles that are simple to play and yet addicting to the core. 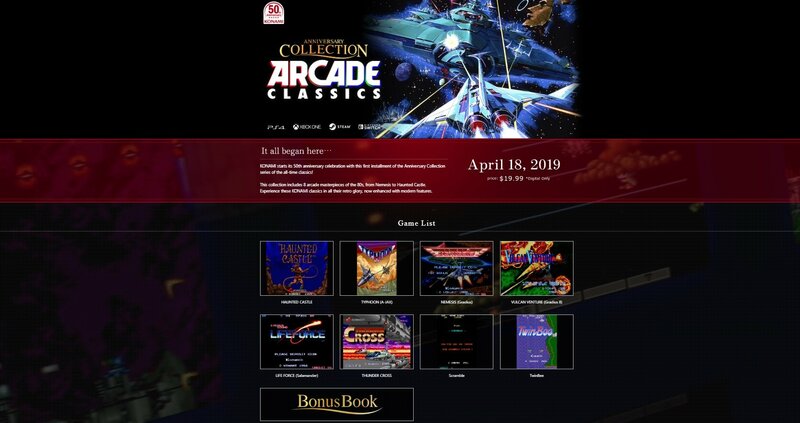 The first Anniversary Collection to release is the Arcade Classics set which will be available on Xbox One, PlayStation 4, Nintendo Switch, and PC via Steam starting April 18. As explained by Konami in the statement above, the Anniversary Collection series will only be offered in a digital format and will be available on each platform’s respective storefront. Like Anniversary Collection: Arcade Classics series, both the Castlevania and Contra series should be available on Nintendo Switch, PlayStation 4, Xbox One, and PC via Steam sometime later this summer. There’s no word as to whether or not they’ll also be priced at $19.99, though it’s definitely a possibility. For more on the Anniversary Collection series, be sure to check out Konami’s website. After reviewing the games on offer, what are your thoughts? Are you planning to grab the Anniversary Collection for Castlevania or Contra, or will you jump on the Arcade Classics set once it’s available on April 18? Let us know down in the comments below!